60s Outerwear, Retro Winter Clothing Patterns - Slightly fitted double breasted jacket with notched collar has full length sleeves with button tri. Flap and topstitch trim. Skirt with released inverted pleats and slightly flared pants with cuffs have waistband. Purchased sweaters. 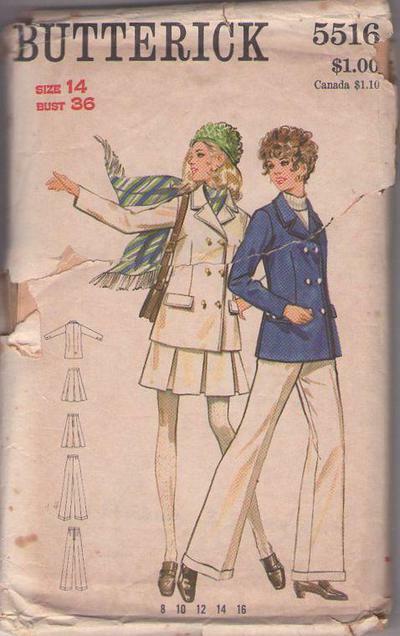 CONDITION: This original vintage sewing pattern was cut & used. All pieces appear to be complete and intact and have been neatly refolded with the original instructions. Envelope has tear across the front.